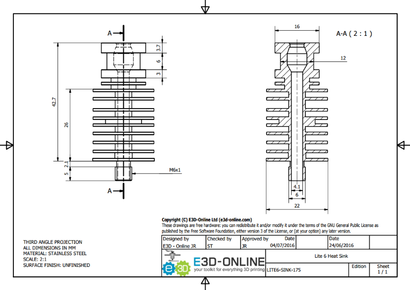 See E3D-Lite6 Assembly for the assembly instructions. Please follow them to the letter! 4 x Plastfast30 3.0mm x 16mm screws to attach the fan to the fan duct. 800mm of 4mm outer diameter, 2mm inner diameter PTFE tubing. 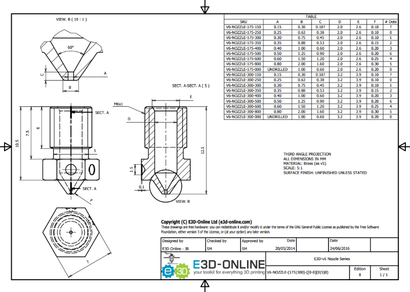 The following E3D-v6 guides will be for the most part applicable to E3D-Lite6. 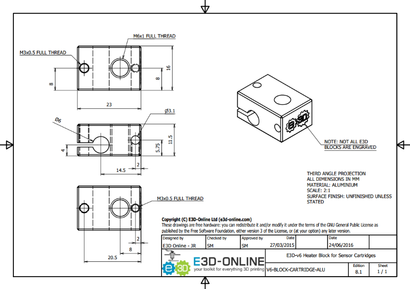 Please do follow the E3D-Lite6 Assembly document as the primary assembly manual. The most important difference between the E3D-v6 and the E3D-Lite6 is the hot-tighten temperature - Never exceed 245C with your Lite6. There is £25 store credit available for any guide produced which conforms to E3D's Acceptable Guide Standard. Heat up your HotEnd to 245*C. Do not overshoot as you risk damaging the PTFE liner. Gripping the heater block tighten the nozzle. The only difference between E3D-v6 and E3D-Lite6 fan ducts is the colour. The fan duct has been carefully designed to direct flow over the fins of the v6 heatsink so that it gets the cooling it needs. The design is for injection moulding but will work just fine when printed. The STL and STEP files are available on thingiverse.